We are recruiting right now! Get yourself along to Portland Recreation Centre, McGill Road Portland on Thursday nights from 6.30 onwards…we have public skating from 6.30 till 7.30 – it’s $5 to skate and you can hire skates, helmets and pads for a bargain sum of $1 – and if you’re keen to find out more about derby our “fresh meat” (newbie) classes are from 7.30 -8.30. 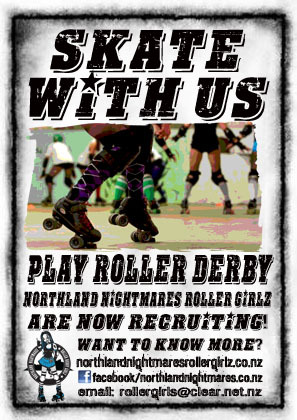 Our advanced players train from 8.30 onwards, if you want to find out what roller derby is all about! This entry was posted on January 26, 2013 by nnderby. It was filed under EVENTS! .